Get moving with the Mobile WorkStand. This cart is a modular system that’s customizable to your exact needs. Attach arms, pivots and cpu holders, as well as many other options. 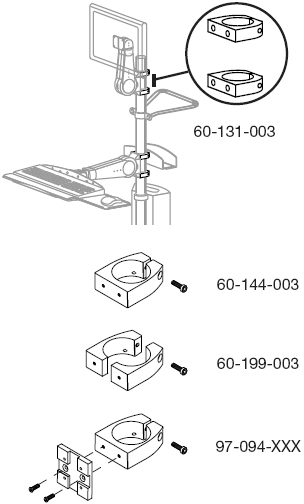 Mobile WorkStand is configured to order. Consult an Ergotron representative to insure the correct part numbers are procured. Footrest, storage basket, base tray, cable box, cpu holder, cable management kit. For LCDs, Keyboards and Notebooks: LX Wall Mount LCD Arms, LX Wall Mount Keyboard Arms, 200 Series Wall Mount Arms, 200 Series Pivots, 400 Series Arms, LX Notebook Tray. Remove extensions if mounting LX Arms; if mounting 200 Series Arms, only one extension is recommended. Adding extra extensions may cause a tip hazard. For both arms/pivots and peripherals, select the appropriate bracket listed below. Attach anywhere along the Pole. Note: Brackets provide attachment holes on two sides. This allows an additional Arm or peripheral to be mounted on the opposite side. For use in sitting, standing or sit-to-stand applications. Easily adapted for use with CPUs, tablet PCs or notebook computers. Heavy-duty, locking casters easily move over carpets, hard floors and thresholds.